Gerard Gourgue grew up young when his mother passed away just days after his birth in December of 1925. This first personal struggle created in him a resilience that would carry him through some of the most trying times in Haiti's past. His is a history of politics, and its eternal dance between what is right and what is wrong. It is almost certainly clear on what side Gerard Gourgue falls. Even as a young man, his interest in politics, his academic performance and even his association with future greats like René Depestre gave insight into his early possibilities... show me your friends. He would live his life as a politician, a minister, an ambassador, lawyer, teacher, human rights activists and, for one brief moment in Haitian history, he almost added president to his list of accomplishments. It would have been a position that suited him. A career in law, his membership on the Port-au-Prince Bar Association, his tenure as a professor at various universities in constitutional law, not to mention his role as Minister of Justice, though short-lived, gave him a considerable advantage. His moral compass led him to resign the post of Minister of Justice after a month, but it also led him to seek the ultimate stewardship of his country a year later. 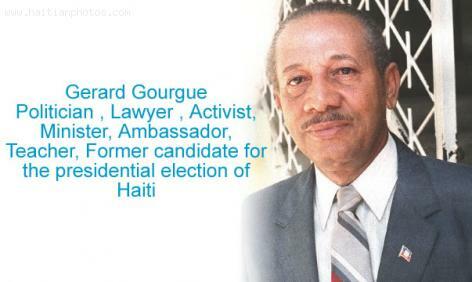 It seemed a surety that Gerard Gourgue would be named Haiti's president, until the November 29 massacre of FNC voters, by the dozen, put paid to dream of a fair election and the Provisional Electoral Council's dismantlement. He's since worn other titles, like UNESCO Ambassador to Haiti, and in 2001 Gerard Gourgue was symbolically named as a Haitian President at the swearing in of President Jean-Bertrand Aristide. I had once the privilege to meet Me Gerard Gourgue. A strong mind.The man of no compromise.